Hair styling is one of the most popular fashion trends that captivates masses in a matter of days. Although today’s women have plenty of choices and options when it comes to hair styling, there is one cut that is present from centuries and no matter how much time has elapsed, this haircut is still popular as ever. This haircut is popularly referred to as bob cut. In fact, people have merged and combined it with other cuts to introduce more variations but classic bob cut is definitely the most preferred choice. There are many forms of bob haircuts for women and they are consistently modifying into better versions. You can select any one form of this cut according to your face and preferences to enhance your youthful look and beauty. This is the most traditional type of bob cut, if you don’t want to do any experimentation with your hairs (due to any reason) then go for this cut. It suits on all types of face cuts. If you are business style women and wants to be in highlights then this graduated bob is the most appropriate choice for you. A decent yet boyish look is gained by this cut. This type of cut is for the women who loves wandering around streets, likes dancing and singing, trying to capture the beauty of the environment. This cut will help you get a traditional bob style along with some waves which will add a classic trendy look. To be different yet classy is the aim of every woman. They want to get appraisal and attention from their loved ones, if you are the one who try different things, love to do experimentation and want to be distinctive then cute curly bob is the best choice for you. Some curls will be added after cutting the hairs; this will give a very glamorous, and highlighted look. Most of the women don’t want their hair length to be so much short because they don’t want a jazz look. This shoulder length bob will give you the style without compromising on length. Unequal cuts are present in this type of cut; an extra time is needed for styling of asymmetrical bob. But the advantage of this typical cut over the others is that it looks so stunning that you will go for this cut next time. It is not a traditional type but gives a different and classic look, the color done on the hairs after cutting appears so appealing and the messy look goes so appropriate with high school and college girls, it will add some extra touch in their fun parties and outings. It is the basic and simple types of bob haircuts for women. If you don’t have much time for styling or have busy ongoing schedules, you must prefer this look because all you have to do is some blow dry after shower and you are ready to go. Layered bobs are mostly suggested to women who have thin hairs and less volume, after proper blow dry they appear as a thick bunch. It is noted that an extra boost of confidence is added in the women and they can face more challenges. Rock band girls prefer this cut as it provides a bangy look and the red color adds an extra bounce to the volume. This cut adds a lot of attractiveness along with elegance and also provides a seductive look needed for running a band or a jazz group. 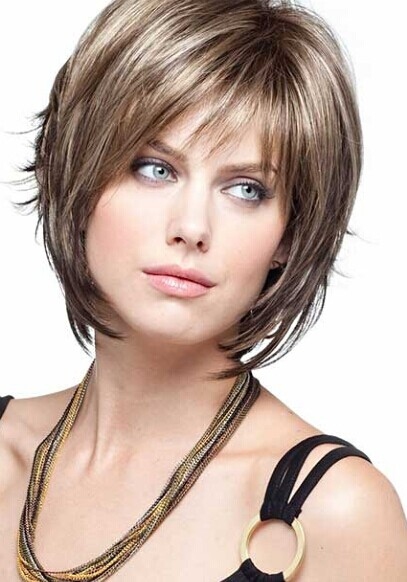 Bob cut provide a personalized look, vary from person to person. Usually providing an oval face is the main aim. Women with a heart shape face are advised to set their hairs from side part while women with straight face are advised to set hairs from the midline. If a woman has a square face then it’s better to frame the hairs towards the chin from the center. Your hair type and texture has a great impact on the cut you are taking. It is suggested that if you have a low volume hair (thin hair) then you must go for layered bob or chin length bob and if you have a high volume hair (thick hair) then go for shoulder length bob. It is better to take suggestion from the hair stylists at the saloon and they will guide in a proper way about what cut you should take according to your hair type and texture. Many times women have a very busy schedule and they don’t get enough time to style their hair daily. So it is advised to take the bob cut which is easy to style after cutting, like if you have thick hairs and you take curl bob then it will take a bit extra time to get styled compared to others. Bob cut is not considered as a safe cut because once you cut the length it takes about 5-7 weeks to get another hair style. When you go for a haircut first, collect some pictures of the bob type that you want to consider. Then for further suggestions, ask to your stylists as they have an idea which cut suits best on your face. As the basic bob has a short length, you have to be very careful after taking a bob. It is usually seen that the hair can go messy after a month and a half of cut, because the hair grow irregularly so it is very important to maintain the bob after you take your favorite haircut.